SMALL BLOCK CHEVY 6 4340 EAGLE H-BEAM CONNECTING RODS SET OF 8 PART# - CRS6000B3D Free your engine's horsepower on the wings of Eagle H-beam connecting rods. Their 2-piece, forged, vacuum-degassed, 4340-certified steel construction provides outstanding strength, while still weighing much less than stock rods. Each rod is multi-stage heat-treated, X-rayed, sonic-tested, magnafluxed, 100 percent machined, and then shot-peened to stress-relieve the metal. The rods have precision cap alignment sleeves to positively locate each rod cap, silicon bronze bushings for floating pin models, and are available in stroker models that allow additional cam-to-rod clearance for large stroke combinations. They come standard with 190,000 psi rated ARP 8740 and 230,000 psi rated ARP 2000 rod bolts, or 265,000 psi rated ARP L-19 bolts as upgrades. Instructions and rod bolt lubrication are included. 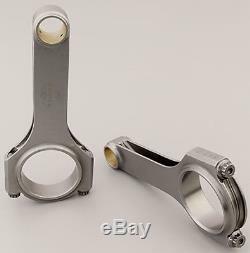 6000B3D SPECS Connecting Rod Length Center to Center (in): 6.000 in. Connecting Rod Beam Style: H-beam Connecting Rod Material: Forged 4340 steel Connecting Rod Finish: Shot-peened Wrist Pin Style: Floating Clearanced for Stroker: No Cap Retention Style: Cap screw Connecting Rod Bolt Brand: ARP Connecting Rod Bolt Diameter: 7/16 in. Connecting Rod Bolt Material: 8740 chromoly steel Fastener Yield Strength (psi): 160,000 psi Connecting Rod Bolt Head Style: 12-point Approximate Connecting Rod Weight (g): 645 Rod Journal Diameter (in): 2.100 in. Big End Bore Diameter (in): 2.2250 in. Pin End Bore Diameter: 0.927 in. Notes : Custom pistons required when using longer than stock connecting rods. Clear Standard Base Circle Cam at a 3.75 Or Longer Stroke without Additional Clearancing of the Large End of the Rod (proper clearance still should be verified for your specific application prior to final installation). ROD CLEARANCING IS AVAILABLE FOR ADDITIONAL CHARGE. NOTE : S hipping prices listed are for the contiguous 48 US states only. We have been in business for over 30 years building some of the fastest race engines in the southeast with the best parts around and we are excited to now offer these parts to you at affordable prices. Our machinists are the best in the business and our sales staff is friendly and knowledgeable. Please message us with any questions about our items, we will be happy to talk to you about your project. Check out our other listings and check back often as we are adding more items everyday! 3353 East Stone Drive Kingsport, TN 37660 BUILDING HIGH PERFORMANCE AUTOMOTIVE AND MARINE ENGINES COMMITTED TO HIGH QUALITY AND PRECISION. 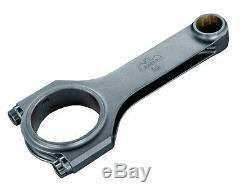 The item "SBC SMALL BLOCK CHEVY 6 4340 EAGLE H-BEAM CONNECTING RODS CRS6000B3D" is in sale since Wednesday, February 1, 2017. This item is in the category "eBay Motors\Parts & Accessories\Car & Truck Parts\Engines & Components\Pistons, Rings, Rods & Parts". The seller is "whiteperformanceandmachine" and is located in Kingsport, Tennessee. This item can be shipped to United States, Canada, United Kingdom, Denmark, Romania, Slovakia, Bulgaria, Czech republic, Finland, Hungary, Latvia, Lithuania, Malta, Estonia, Australia, Greece, Portugal, Cyprus, Slovenia, Japan, China, Sweden, South Korea, Indonesia, Taiwan, South africa, Thailand, Belgium, France, Hong Kong, Ireland, Netherlands, Poland, Spain, Italy, Germany, Austria, Bahamas, Israel, Mexico, New Zealand, Philippines, Singapore, Switzerland, Norway, Saudi arabia, Ukraine, United arab emirates, Qatar, Kuwait, Bahrain, Croatia, Malaysia, Brazil, Chile, Colombia, Costa rica, Panama, Trinidad and tobago, Guatemala, Honduras, Jamaica, Viet nam.